Chris is 19 years old, weighs 180 lbs, and stands 5’10” tall. He wears on unkepmt beard and cares little about his dress. Whereever he goes, Chris carries two overstuffed bags containing his essential items: 1 battered Ukulele, 1 portable DVD player with charger, 1 digital camera with spare AA batteries and a memory card, a small folder holding burnt DVDs, noise cancelling headphones for the bus, a snack of orange soda and a pastry, and other miscellaneous items picked up over the years. The contents are never parted with and if anything goes missing…a severe escalation in anxiety and frantic pacing always ensues. These objects move with Chris from room to room, place to place, and activity to acitivity. Typically, the DVD player is out and playing some variation of “Scoobee-Doo”. Often the digital camera is playing (a recorded television show) simultaneously. Chris takes comfort in his things. He knows his cartoons by heart and will routinely play a short clip over and over again while acting the scene out for himself and occasionally for those around him to see. His mannerisms mime those of the characters in his cartoons as closely as humanly possible. He feels more comfortable sitting on the floor than in a chair and will choose the far corner of a room if its available. When a room gets loud and crowded with people, Chris will try to further partition himself from others, by way of a curtain, coat rack, or other objects that act as a barrier. The feeling of others encroaching on his space seems to make him more uncomfortable than anything else. In times like this, Chris will begin rapidly packing his things and run for the closest exit, unwittingly knocking over people and things that may stand in his way. He will scream while running through the crowds and not stop until he reaches another safe corner in another quiet and partially-abandoned room. This physical reaction to others proximity is not uncommon for Chris. When confronted or addressed, especially in an aggressive or coercive manner, (trying to transition him from one activity to the next before he is ready) or without warning, this need to flee always results. Chris will bang his head on the wall, hit if he is restrained from running out of a room (sometimes into the street), and scream when he feels unsafe or uncomfortable with those around him. His behaviors are not exceptional to individuals with autism, but they are severe. Chris is a smart boy. He knows his way around a computer and loves music. He will occasionally perform when the environment is right – soothing, unconfined, and accepting of his eccentric manner – and when he does, he really shines. Chris’ anxiety and inability to adequately articulate his needs when in a group setting leaves him isolated for the majority of the day. Reciprocal interactions are rare, but it does occur if the practitioner/peer is willing to meet Chris at his level. In one-on-one settings, Chris is able to keep a closer proximity to others and carry out short, on-topic exchanges. The environmnent around Chris holds so many different sensory triggers. 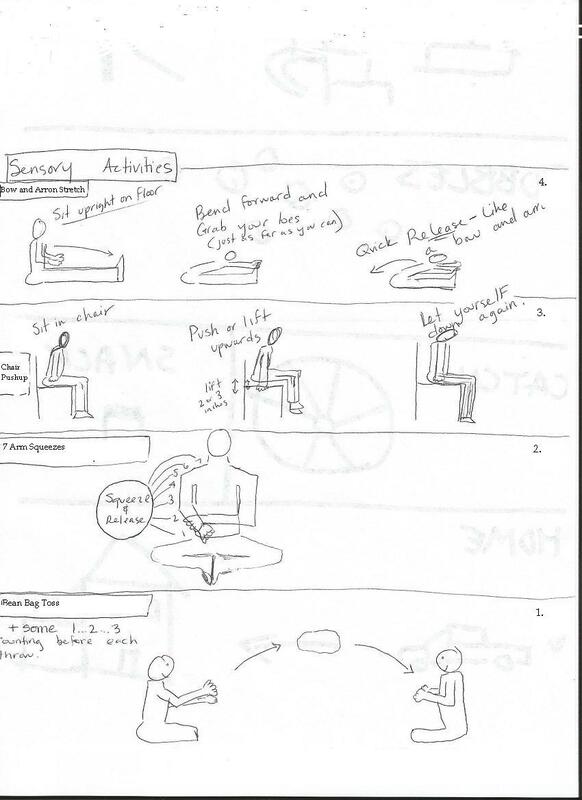 Like with any individual on the spectrum, these triggers needs to be identified and implemented into the work one does with Chris, as sensitively as possible. Chris’ anxiety in social settings and his response to feelings of overstimulation (tactile, sound and visual in particular) are things that must be strongly considered and respected when attempting to engage with him. If a menauingful relationship is to be built, understanding someone like Chris is the first step. Engaging with Chris and helping him reduce feelings of anxiety works best when he is given a meaningful, semi-structured task (like helping to wash dishes or preapre snack). For engagement and skill building, one-on-one work is key. It helps when others allow Chris to have his essential items close by. Like a child’s transitional object used on the first day of preschool, Chris’ things bring him comfort in unpredictable new settings. A soft voice and slow body movements help Chris to interact with others with more ease and closer proximity. Music and movement activities, with small groups and open exits feed into Chris’ passion for self-expression through song and dance. I encourage parents and practitioners to write a small case study like the one above. You will be amazed at what you know/what you’ve forgotten you know. It will ultimately help you relate to your child in a deeper and more informed way. This week I facilitated my first friendship “match” between two young teen clients on the autism spectrum. I created the Make-a-Match Program for children and families on the spectrum with the hope of building a greater network of social support in their lives. Sam, age 11, and Jimmy, age 12, both present with Asperger’s.Following introductions, where I basically told both mother’s to exchange contact information and leave us alone, I took the boys on a walk to visit a small fishpond. This gave them a chance to look one another over without being directly expected to interact in my small office space. Within minutes, Jimmy looked over at Sam and asked, “You have autism?”. Sam hesitantly replied, “Yeh”. “Asperger’s?”, asked Jimmy. “Yes”, said Sam. “Me too”, responded Jimmy. As I fell back to watch this beautiful interaction unfold, I saw Sam smile. Later, we spoke about the scary transition to middle school. Jimmy had made the jump last year. Sam was doing it in September and was feeling pretty anxious. When I asked Jimmy if he had any advice, he stated “If a bully tries to bother you…tell a teacher”. This sparked a back and forth exchange between the two boys about their ample run-ins with bullies, including strategies like “punch him in the face” and displays of awkward martial art-like moves. Watching these boys share and listen to one another’s “bully” stories was an incredible experience to witness. It was as if the boys were screaming to one another, “You are not alone…it’s not just you”. At least that’s how it felt to me. Later on, we discussed what each was “looking for in a friend”. Both agreed that a friend was someone who “Hangs out… and doesn’t just stop being your friend”. Jimmy shared that he had never “stayed over” a friend’s house. Sam indicated that this was a rarity in his life as well. At the end of our time, I asked both boys if they would be willing to meet (with me as buffer) once again. “Yes”, they replied. Friendship is a vital piece of every human being’s life. We crave human connection, whether it’s someone to play video games with on a Saturday night, or someone to confide in when we’re struggling with a bully at school. Children on the spectrum so often struggle to make these friendships, but it doesnt mean they don’t desperately crave them. I encourage you (parents, teachers, therapists) to create your own “Make-A-Match Program”. I would be more than happy to send the liability/release form that I created to anyone interested. Here are a few really helpful sensory regulation exercises that you and your child can do together once or twice per day at home. These exercises have a few simple goals: to help your child release tension in his/her body, to create a time during the day for a quiet, structured and predictable activity, and to provide a chance to get the body into a more balanced rhythm (specifically with the bean bag toss). This can take all of 5-10 minutes out of the day and can be easily added into a visual schedule. 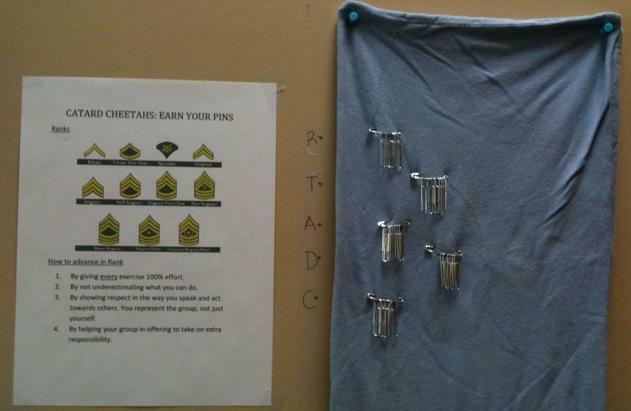 Earn Your Pins: Behavioral Plan for meeting goals and following expectations. In the military, A Private in the army has to meet certain goals and expectations to ascend in rank. When certain actions are done to a level of quality that is considered satisfactory, then the Officer in charge awards the private a higher rank (I’m simplifying of course). This is a very simple but powerful concept that works as a motivator for behavioral change. It can work in the home by coming up with a few basic expectations (Note: do not set too many expectations at first). In my example below, which I use with my Teen Fitness Group, the expectations for behavior in the group are listed under the heading: “HOW TO ADVANCE IN RANK”. At the end of every group (2 hours in length), the group members are awarded their pin for meeting the 4 expectations. I call this time, “The Pinning Ceremony”. Its cheesy, I know, but the group loves it. If they haven’t met expectations, than they don’t earn their pin for the day. It’s that simple. If you believe your child needs additional incentive, you can set a weekly/daily/monthly reward when a certain rank is reached. This gives the child something tangible to work towards and allows him/her to see progress and assess how much it will take to reach their goal. My setup in this picture below is very simple to follow and provides a good visual for the child to reference as they are working up the ranks (The letters to the left of the pins represent the 1st Initial of each group member). How do you explain autism? Its definition can often be so vast and yet, the disorder can be marked by such subtlety. I find it hard to explain Autism because it effects each individual so differently. Almost always, the individual with Autism struggles socially. Most directly in their ability to relate with others in everyday conversation (basic engagement, picking up social cues, showing interest, reciprocating in dialogue, recognizing sarcasm, etc) and in developing strong mutually beneficial friendships. The great majority of individuals with autism have significant sensory integration issues that make their experience of the sensory world (sight, sound, touch, smell, and taste) more challenging to gain control over and regulate than the typically developing individual. Sounds are deafening, slight touch from another sends the individual into a sprint, smell and taste sensitivities lead to an incredibly limited diet, and sights are the source of almost continuous over-stimulation and difficulty focusing. In all of the individuals I have worked with, the need for a more structured and predictable day is present. Visual schedules, daily routines, pre-planning of trips, and reviewing of changes long before they occur, are often an absolute necessity for the individual with autism. Hyper-fixation on one subject or interest is a common characteristic of autism (this can change every few months or last for years). An incredible mastery of a specific topic often results (black holes, Portland transportation system, etc). It is not unusual for a child with autism to speak about an area of interest continuously, with no awareness of their audience’s interest or lack there of. This is often paired with a “stuckness” and inflexibility in thought. When the individual gets “stuck”, he/she needs to complete an action or statement several times before moving on. Outside pressure from peers or adults to “just stop” or “move on”, often causes further anxiety. Control is something the individual with Autism needs. This can often result in social alienation and the appearance of selfishness. It is easy to see this behavior as selfish, but that would be shortsighted. It is more a desperate attempt to regain some sense of order and control in a perceived chaotic and unpredictable environment. Daily routines that cannot be changed, special interests, and ritualistic behaviors (lining up toys in a very specific way) are some ways that individuals with autism gain this control. Motor and fine motor skills are more often than not developmentally behind; making activities like Physical Education (PE), sports, penmanship, etc. challenging. I cannot tell you how many of my clients routinely get into conflict during PE class. These are just some of the many familiar characteristics of autism. I ask, for my own benefit and the benefit of my readers, that you add to this list. The more we know, the better we can begin addressing this unique disorder in a more effective way. Please add to the list, by submitting a comment below.